While you may think that's too much, the intent of this book is not to argue how many hours of screen time your kids should have. That's a decision for you as a parent, knowing your child and balancing issues like family time, school, and recommendations of trusted advisors like pediatricians. But it can't be denied that this amount of screen time has a significant impact on parenting, particularly when it comes to understanding and interacting with our children. If we don't understand how a child is responding to what they're watching (or playing), then we don't understand that child, because they spend more time with screens than they do with any other activity outside of sleep. I had heard her laughing and giggling from the other room and assumed everything was fine. Was I wrong! She needed to talk and she wanted someone to listen. So I stopped what I was doing and walked with her to the porch. There, I started asking questions and listening to her answers. 'What were you watching?' I asked. 'People in the show or people watching? She nodded, looking forlorn, and I leaned down and opened my arms. 'Would it help if you sat on my lap for a hug?' I offered. After she nodded, I took her on my lap in the rocking chair, and we started rocking. 'Sometimes no one can help them,' said my niece. 'Sometimes at school. My teacher says I'm not smart and no one can help me.' Ouch! Here I had to wait a beat and absorb what she had said. I'm truly grateful that she came to me and we were able to talk things out; otherwise, I can't be sure how it might have impacted her. My niece opened up to me because she felt comfortable. I paid attention to my approach, tone, and tempo when drawing out the details of her experience, and I genuinely cared about what she had to say. Chloe's story brings us to a topic that affects many parents. While this book provides many techniques for young children, what do you do when there are big age differences between children watching together? In some families, the access to tablets and smart phones has made this less of an issue because the older children can play games or watch different content on their devices while the younger ones watch age-appropriate content. But for times when the age differences between your young digital natives may still pose a challenge, see special tips in Chapter 13. So let's look at the bigger picture of adult-child communications. It won't surprise you to learn that the best adult-child communications start with active listening, an accessible skill that turns you into a super parent. Although it's often associated with counseling and conflict resolution, it's a skill every parent needs. Plus, as a parent, with active listening you're ahead of the game from the start because you don't need to take several sessions to learn the trigger points, temperament, and background of your child, the way a therapist would with a client. Active listening is a way of listening and responding that promotes shared understanding and builds better relationships. It starts with the goal of truly understanding the feelings and ideas of the child, something to which every parent aspires. How many times have we listened with 'half an ear' and assumed we know what the child is saying? Active listening replaces both those behaviors with a simple strategy that will yield greater closeness and far more effective parent-child communication. Concentrate. Give the child your full attention. Understand. Don't assume you know; listen with an open mind. Respond. While the child is speaking, nod and show your attentiveness, then respond verbally once you've fully understood. There are many hidden benefits to active listening. For example, it conveys to our children that we value what they say and that we value their opinions, even when those opinions may differ from our own. This is a confidence-builder for children and encourages independent thought. In the 'remember and respond' phases, active listening also generates a free flow of ideas, not only facilitating exchange and sharing, but allowing parents and children to appreciate the differences and connections between their ideas. But first we need to be able to get our children to talk to us! ©2018 Nicole Dreiske. All rights reserved. 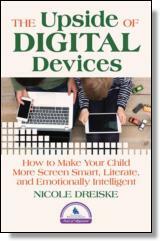 Reprinted from The Upside of Digital Devices: How to Make Your Child More Screen Smart, Literate, and Emotionally Intelligent. No part of this publication may be reproduced, stored in a retrieval system or transmitted in any form or by any means, without the written permission of the publisher. Publisher: Health Communications, Inc., 3201 SW 15th Street, Deerfield Beach, FL 33442.